There has been increasing evidence in recent years to support this supposition that global warming is linked with solar activity. In their book, The Neglected Sun, authors Fritz Vahrenholt and Sebastian Luning pose that temperatures could be two-tenths of a degree lower by 2030 as a result of an anemic sun, which would mean warming getting postponed far into the future. Note that these reports are from researchers around the world. The rest of the article is HERE with the references. Russ, According to this sunspot cycle chart, we have had 7 cycles in a row of hot sun sunspot cycles if you include cycle 20 shown here http://images.intellicast.com/App_Images/Article/130_3.png So the answer to the question is yes. 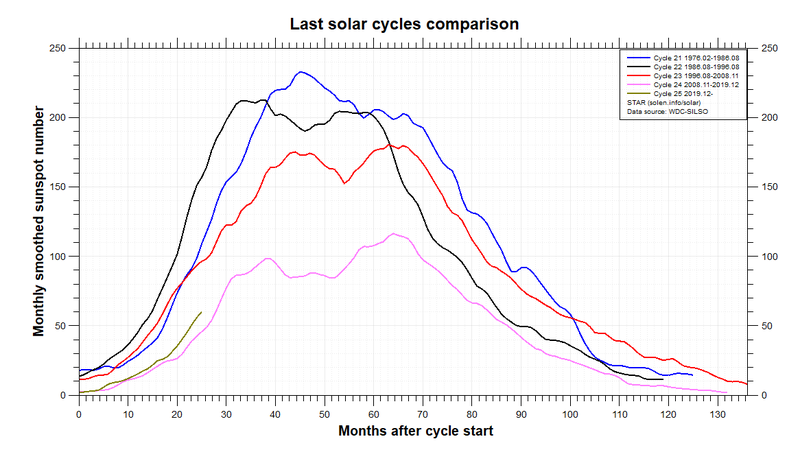 Cycle 24 is not even close to cycle 20 shown here http://www.solen.info/solar/images/comparison_recent_cycles.png Based on this chart, I do expect cooling will happen more deeper than the 1970’s once we are at minimum of cycle 24 going into cycle 25. The solar wind cannot even keep the Jetstream up to the north long enough for us to have a hot summer this year. I know it’s not the volcano’s, or the ocean’s cooling this time around. As far as this cool summer, there where some nights in July, and now August wear we did not have to use the a/c. The only time I remember this happening was back in the 1970’s as I’ve lived in New Jersey all of my life, and know what a normal summer is, or what it used to be. With the temperature not reaching the 90’s this month of August, and temperatures trying to reach the low to mid 80’s during the day, ocean cooling will begin this year on the northern Atlantic side. Thanks for the chart links. I agree, we will see more cold than we did in the 1970s, when we were living in Omaha NE. Please do not post naked links. Give us your prospective on why this is an important link. It has also been a cool summer here in Colorado. I do have an interesting observation about this summer. The day time high will reach 80 F, but for all of 15 minutes. It will take most of the day to get there, then back in the low 60’s or even 50’s. During a normal summer, it will be quite a bit warmer, and the temp starts out warm and quickly warms during the morning hours, reaches near the high and stays there, falling off slowly at night. We actually turned on the heat one day in July. Two things you didn’t need in NJ during the 70’s, air conditioning and a swimming pool.